the Syria Democratic Forces supported by ground and air forces of the International Coalition started on Saturday evening to target what is left for the Organization on the east bank of Euphrates River in the eastern countryside of Deir Ezzor, breaking in what is left of areas for it, and this attack by SDF and the Coalition was accompanied by the flight of the International Coalition warplanes over the area and careful advancement as a result of the mines planted by the Organization in the vicinity of the enclave under its control, and reliable sources confirmed to the Syrian Observatory that the International Coalition aims through this attack; to completely end the existence of the Organization in the area, after the negotiations that took place between the Coalition and the Organization, after the request of ISIS members and remaining leaders to surrender in exchange for providing a safe passage by the Coalition towards unknown area, which prompted the Organization to make promises to those who remained with it to open a corridor from the enclave. raising to 1279, the number of members and leaders of the “Islamic State” Organization, who were killed in the clashes, detonations and raids, while it rose to 678, the number of fighters of the Syria Democratic Forces who have been killed since the 10th of November 2018, also it rose to 401 people including 144 children and 86 citizen women (including 233 Syrian citizens including 99 children and 57 women of Syrian nationality) the number of civilians killed since the 10th of December 2018, also the “Islamic State” Organization had executed more than 713 detainees, of who were arrested on various charges including security members and members of the Organization who tried to break away of it and escape its controlled areas, and the executions were carried out inside headquarters and detention centers of the Organization, and within its controlled areas which are today confined to the towns of Sha’afah, al-Susah, al-Baghuz and villages of Abu Hasan, Bo Badran, al-Marashdah, al-Shajla, al-Kashmeh, al-Safiya and al-Bukhatir suburb east of Hajin, which extends along the east bank of Euphrates, along with its last enclave in the deserts of Homs and Deir Ezzor. The Syrian Observatory for Human Rights published this morning that preparations continue in the eastern countryside of Deir Ezzor, in conjunction with the cautious calm that imposes itself on the area, and in the details monitored by the Syrian Observatory for Human Rights: the cautious calm prevails the remaining enclave of the “Islamic State” Organization, at the east bank of Euphrates River within the eastern sector of Deir Ezzor countryside, in conjunction with the underway negotiations between the Organization’s leadership in the 4-km² enclave and between the International Coalition, to reach a consensus on the surrender or exit of the Organization’s leaders with the rest of their families towards a destination that still unknown so far. while the Syrian Observatory monitored calm interrupted by targeting by the Coalition Forces and the Syria Democratic Forces as a pressure on the Organization, to accept any consensus in any form and to prove the seriousness of the Coalition and SDF in the preparation they are carrying out in the vicinity of the remaining enclave for the Organization . To completely eliminate it and to terminate its presence in the east of Euphrates, and if the Organization loses the enclave and surrenders, it will only be in control of an enclave within the Syrian territory with an area of about 4000 square kilometers in the Syrian desert, within the north of Homs and the outskirts of Deir Ezzor Province, in addition to its presence on as sleeper and active cells in east of Euphrates and in other areas of the Syrian territory. And the Syrian Observatory published yesterday that the Syrian Observatory for Human Rights learned that 16 people of different nationalities were able to get out of the remaining enclave of the “Islamic State” Organization, and reached Syria Democratic Forces’ controlled areas, and the Syrian Observatory learned that 12 men and 4 women who are wives of ISIS members of Russian and Uzbek nationalities, have gotten out of the last 4 km² remaining for the Organization on the east banks of Euphrates River, and this is the first batch that was able to exit since the last batch which came out about 48 hours ago, raising to 37101. The number of persons whose exit has been documented by the Syrian Observatory since the 1st of December 2018 until today, the 6th of February 2019, of different nationalities of Syria, Iraq Russia, Somalia, Philippine and other Asian nationalities, and more than 35051 of them have gotten out after the decision of the American president Trump to withdraw from Syria on the 19th of December 2018, including about 3400 members of the organization of those who infiltrated within the displaced people, and they were arrested after the residents recognized them and reported the security services about their infiltration, and the other group surrendered themselves after they managed to get out of ISIS last enclave. The Syrian Observatory for Human Rights obtained information from several reliable sources that the International Coalition forces continue to negotiate with the “Islamic State” Organization, in its last enclave at the east bank of Euphrates River, which is about 4 square kilometers, to reach a consensus about the fate of members and leaders of the Organization in this enclave; along with their families and the remaining civilians in the area, and in the details obtained by the Syrian Observatory: negotiations are taking place between both parties, in conjunction with the military pressure by the International Coalition, through shelling the area and seriously threatening the Organization with the decision of completely eliminating it in the east of Euphrates area, while it is anticipated for the corridor that the “Islamic State” promised to eb opened, the Organization promised the civilians and fighters in its last remaining enclave with that, and reliable sources confirmed to the Syrian Observatory that the Organization promised civilians to open a safe passage for them within the next few hours or days. The Syrian Observatory published on Thursday, the 7th of February 2019 that the besiege and closing the way out of the “Islamic State” Organization area east of Euphrates not only increased the tragedy of the remaining civilians, but after that the hunger and the rise of prices came to increase this tragedy, where the Syrian Observatory obtained information from local sources within what is left of areas for the Organization (which is about 4 square kilometers). 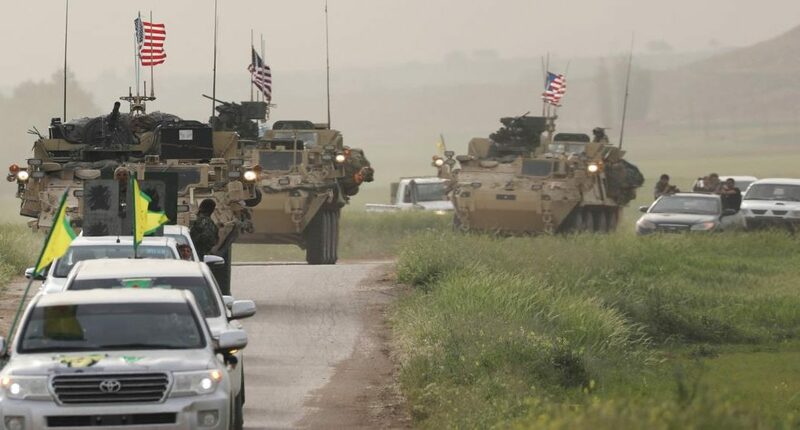 So theta they do not get bombard by the International Coalition, which is preparing with the Syria Democratic Forces to completely end the presence of ISIS in the area in the coming days, and the reliable sources from within the enclave of the Organization confirmed that the smuggling road is long not to mention the bad weather, also the forces deployed in the vicinity of the enclave target any movement from the inside of the enclave to the outside of it, where some families were forced to return to the enclave after being targeted, and these families lost the money they were going to pay to the smugglers when they arrive to their destination, putting them in front of an unknown fate, and through the Syrian Observatory the residents demanded the International Coalition and SDF to open the road in front of the people getting out of the enclave to reach the areas they want to go out to, and then making sure of their identity and affiliations, where they confirmed to the Syrian Observatory how much the situation is tragic, amid fears for their lives from shelling by the coalition or the forces around the area. Reliable sources confirmed again to the Syrian Observatory that tens of children, women, and old people are ill as a result of the poor living, severe shortages of medicines and food, high prices of existing ones, and not to mention the lack of medical care, as the members of the Organization keep the supply to themselves and not giving it for those they take as human shields, and in recent days and weeks the Syrian Observatory has monitored an increase in numbers of casualties as more citizens die due to the deterioration of their health during while they were waiting to be transferred to al-Hool camp, where some of them have gotten out of the pocket with bad health conditions, and the Syrian Observatory documented the rise in number of people who died in al-Hool camp and on the road of death to it, where at least 28 people died due to the cold, illnesses they suffered, deteriorating health condition, and the shortage of medicines and necessary treatment during the process of movement and exit from IS enclave at east bank of Euphrates in the eastern countryside of Deir Ezzor, until they arrive at al-Hool camp, where some of them died as they were getting out of the enclave, while others died in the road to the camp, and among the casualties there are 9 people died due to difficult health conditions.